I do like these covers. The rich, sometimes earthy tones aptly reflect the individual themes of the books, in my opinion. Plus the style of artwork keeps the characters sort of dreamy and vague and I am therefore free to go on picturing them however I please and that is always a good thing. In the Coils of the Snake continues the story of the goblin court and its longtime enemies the "we're one step ahead of extinction" elves. This third and final volume in the Hollow Kingdom trilogy takes place thirty years after Close Kin and begins with the unthinkable. And as if that isn't enough, we find out that all these years he has been secretly grooming a young human girl to be his son Catspaw's bride when he passes the crown to him. The girl, Miranda, is now living in the hollow hill with them and is utterly bereft now that her one friend (and father-figure) is gone and she is expected to take up the mantle of queen to a young and inexperienced king. Her fragmented life becomes further complicated when, on the eve of their wedding, Catspaw puts her aside in favor of a young elf of impeccable pedigree. The move is without malice, as Catspaw faces a stalemate with the elf lord Nir. Nir offers the young Arianna as part of a peace treaty between his people and the goblins. When Miranda finds out her entire purpose in life no longer exists, she refuses Catspaw's offer of sanctuary and runs away. Right into the clutches of the elf lord, who finds her a very useful sort of hostage indeed. This book held everything I hoped for the conclusion of the trilogy. The story splits its time between Miranda and the elves and Catspaw's difficulties wrangling his elf bride and his attempts to subvert Nir's plans. I wasn't as attached to Catspaw as I was his father (Marak was The Top), so I was not as invested in his story. But Miranda was a lovely, sympathetic character and it was a pleasure to watch her find a place where she felt at home at last. I was also glad to finally find a truly noble elf in Nir, after the painfully vicious and unhappy band in Close Kin. And I had to smile at how frivolous the goblins thought the elves and with what disgust and horror the elves, in turn, viewed the goblins. 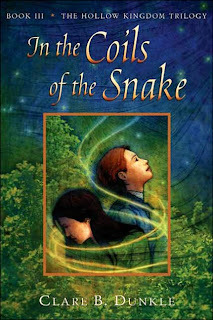 In the Coils of the Snake also, rather notably, has a proper ending, perfect for the book itself and for the trilogy as a whole.